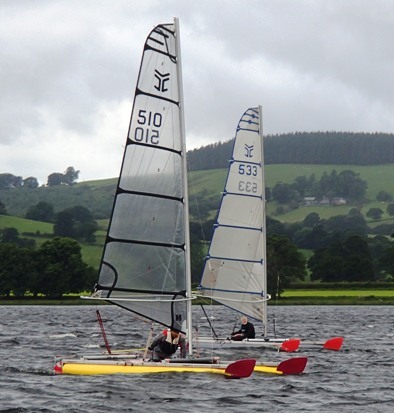 A big turnout, of both committed racers and improvers, had the traditional Bala welcome (for part of their 40th Anniversay celebration) and Gareth Ede and John Terry had their customary front-end battle, pushed hard at times by George Evans and Irish visitor Dermot Mangan. Close racing, and mixed fortunes, saw John Peperell take a first away, and six helms recorded a first or second place. The prevailing SW breeze came up the lake through the extended weekend, getting all scheduled events in (serious and fun.) The breeze dictated a port-rounding triangle, with a fast reach across the lake between the downwind marks. Although the same course held for all races, a series of challenging tactical decisions upwind and down made racing lively. The shifting breeze across the fixed start line made choosing the right end vital when the gun went, and in Race 1 Paul Stuart and Alastair picked the port end advantage hard by the shore and Stuart gained a useful lead. Only Gareth and Dermot chose a starboard start, and Dermot stalled as the gun went to add to the disadvantage. John T from the middle of the line moved out to be ahead at the windward mark chased by Stuart and Gareth. 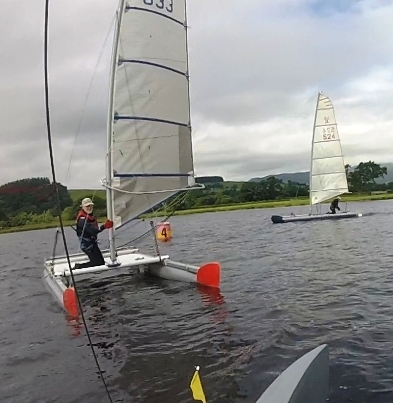 After a close run down to the reach, unable to see the small white mark, John T headed too far upwind allowing Gareth to get past, and he managed to hold the lead for the next lap to the finish. By Race 2 the wind was consistently stronger with some long hard gusts. Syd was an early faller before the start attempting an on-water mainsheet attachment. The fleet was closely bunched for a mass starboard start, and the trapezing boats were well away, with Dermot and John T carrying a slight upwind advantage over Gareth further down the line to the top mark. The next lap saw lots of place changing as the three crossed tacks several times but Gareth started to edge ahead upwind. Lap 3 saw George make a huge comeback, relishing the windy conditions to climb to second. On the final lap Gareth fluffed a tack at windward mark, hitting it so the subsequent 360' allowed George, Dermot and John T to halve Gareth's lead. However, Gareth managed to hold them off downwind and then creep away from them on the final beat to the line. From a close battle for the next three places, George clinched second from Dermot and John T.
The lake first-thing on Sunday morning was glassy, but the predicated SW breeze built up. In Race 3 Stuart and John P caught the fleet napping and surged off the line on starboard with a good lead (photo below) but when they separated up the beat, Stuart was dealt a bad wind-shift hand and fell back. The remainder of the fleet, starting on port, had to play catch up. After the first beat John P was firmly ahead, holding the lead as George surged past Alastair and Paul on the reach and then put in a excellent next beat to challenge John on the finish line. Gareth also managed to climb through the fleet into third. In Race 4 after a tight bunch start on starboard, John T and Gareth carried out to the left, to be badly caught by a shift, still managing to climb out of the pack to round the windward mark first, with Dermot chasing closely. Despite Gareth being on his heels for the whole race, John T held his lead to the end. George put in another strong performance, climbing to third just ahead of Dermot. In Race 5 after a very closely fought first beat, Dermot and John T were ahead. Dermot opted to run closer to shore whilst John T stayed further out. Their lead was short lived as Gareth and Alastair picked up a prolonged gust and surged past on more of a reach than a run. JGareth managed to stay clear of the chasing pack for the remainder of the race. John T and Paul came back through, but Alastair chasing them at the down-wind mark saw them hitting a lull near the shore, and followed Gareth in tacking early, both able to lay the finish line. Monday had a light-moderate SW breeze with the threat of rain. A tight starboard start in Race 6 forced John Terry to tack away right from the blanketting fleet (photo below) while Gareth, starting furthest down the line, benefitted from cleaner air to reach the windward mark first, with John, Dermot and Paul following. A tight bunch of Alastair John P and Syd chased them on the second long run, appearing to be gaining out left, until Alastair gybed onto starboard towards the mark and precipitated a rafting crash (photo further below) Gareth managed to hold off John T to maintain the lead to the finish, ahead of Paul and Dermot. Behind, at the finish, John P rode good breeze out of the bay on port to catch Alastair and Stuart in the last 50 yards as they crept to the finish spit on starboard.